Over the period of years it has successfully trained over 8000 candidates for IELTS, TOEFL, PTE and Spoken English. 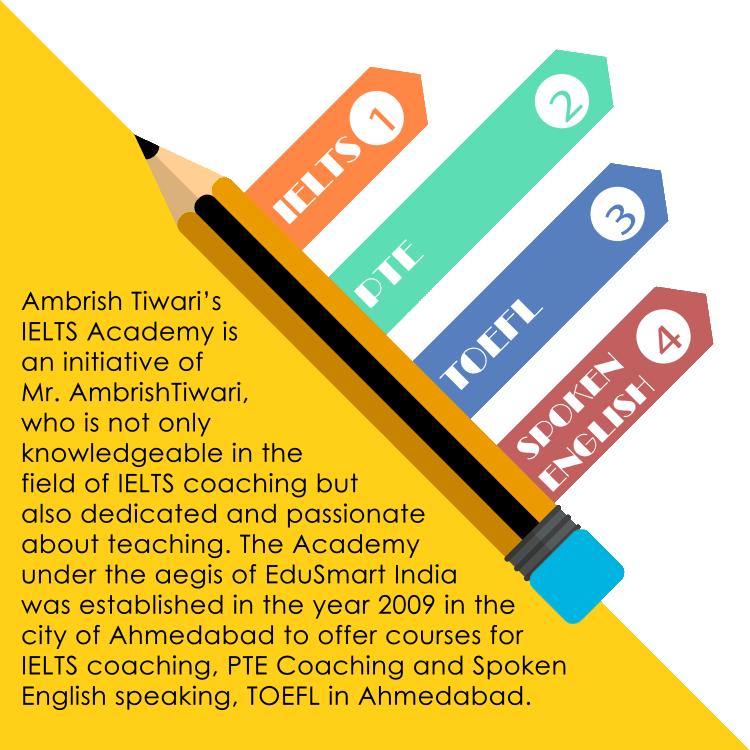 Ambrish is ably supported by Mr. Rishi Mehta (IELTS Trainer), Mr. Hiren Raghu (IELTS Trainer), Miss. Deval Bhatt (IELTS Trainer & Student Counsellor) and Mrs. Yamini Naidu (Spoken English Trainer) at Ambrish Tiwari's - IELTS & Spoken English Coaching Classes in Ahmedabad. At our IELTS institute, more than 90% students have achieved their desired bands in IELTS exam in the first attempt. In a span of just 2 years, we have moved from the top ten IELTS classes. 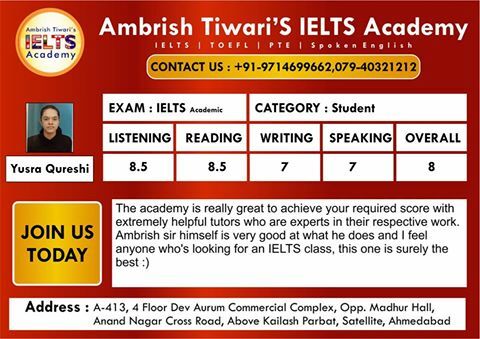 Read our student reviews to know what makes Ambrish Tiwari’s IELTS Academy, the best IELTS Coaching in Satellite. We also offer IELTS training for IELTS – UKVI and Life Skills program. PTE Academic assesses listening, reading, speaking and writing all via computer in a single 3 hour test session. To complete a PTE Academic test, you will need to attend a secure Pearson test centre. You will use a computer and headset to listen to, read and respond to questions. During the three-hour test session there will be three main parts to the test: speaking and writing (together), listening and reading. Spoken english is the most common and most accepted language in the world. It has became the most common way to communicate across the globe. We have designed our Spoken English course in such a way that any one who is willing to learn spoken english can understand it easily. To impart education at its best and in a manner where students can unleash their dreams. 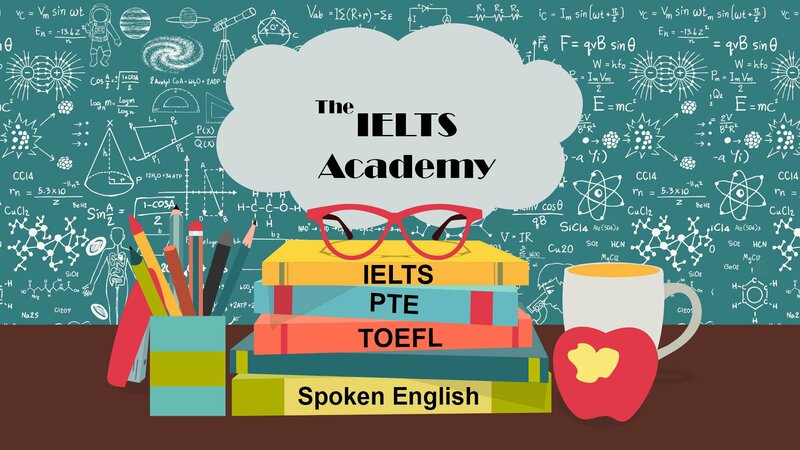 We have been functional as an IELTS Academy for more than 8 years. Every year more than 1500 students are enrolled at the academy. All are faculty members are like-minded fellows with a passion for imparting knowledge they possess. All our faculty members are post graduates with in-depth knowledge about the tasks undertaken by them. Moreover, each member is dedicated for student’s interests. We focus to impart the best education. With flexible batch timings and round the clock assistance, we focus on student-centric approach.